House shopping can be incredibly stressful. There are so many factors to take into consideration when you’re walking through a gazillion homes. You are signing up to invest hundreds of thousands of dollars into a pre-owned home, so the last thing you want is to discover a huge, costly repair that is needed after you get the keys, especially if that repair involved the roof. A typical roof repair in Phoenix can cost from $350 – $2000 or more. If you come to find that a roof replacement is in order, that can cost from $6000 – $45,000, depending on the type of roof that is being replaced. That’s a lot of financial burden after having invested so much into the home itself. Fear not, because we have put together a roof inspection guide so that you don’t end up with any unpleasant surprises where your roof is concerned, or worse, overpaying for a home that will immediately demand a new roof. A freshly painted ceiling – This doesn’t always mean that there is a roof leak, but it could be a sign that someone tried to cover water stains. Best to ask about it rather than leave yourself guessing. Water stained ceiling – This is the most obvious sign of a leak in the roof. Missing tiles/shingles – This disrupts the integrity of the roof, and if they’ve been missing for a while, the roof certainly may have water damage. Curled shingles – If the home you’re looking at has either cedar shakes or asphalt shingles, check the edges for curling. This is a sign that they are coming to the end of their usability. Water damage on fascia boards – Check the fascia boards for discoloration or cracking. This could be a sign that the roof is old. While shingled or flat roofs present potential or existing problems in a more obvious way, tile roofs can seem fine as they hide serious problems underneath. One such potential hidden problem is a deteriorated felt underlayment. This protects the roof from water, and deteriorates over time. It typically needs replacing every 12 – 20 years, so be sure to ask the seller when the last time was that they had the underlayment replaced. If it’s been a while, or they don’t have an answer, make sure that your roof inspector takes extra care on that checkpoint. PHX Roof maintenance is a big part of home ownership, so the seller should be able to answer this without sweating bullets. Of course you will get an inspection by a general home inspector. However, if your inspector recommends that you hire a separate roof inspector, listen to him. Home inspectors have enough general knowledge to spot a potential roofing problem, but unless they are roofers, they are not experts in the field. They may spot a problem that could show potential for a much larger roofing problem, and that problem could lead to a much heftier PHX roof repair. So again, if your home inspector recommends you hire a roof inspector, hire yourself a roof inspector. Request that the seller completes the necessary roof repairs or re-roof. Request a credit so that you can hire your own roofing company and have the repairs done yourself after closing. Do nothing, and continue with the deal, then plan to fix the roof later. Pull your offer and walk. House buying is stressful enough without adding potential roof repairs on the end of the deal, unbeknownst to you. 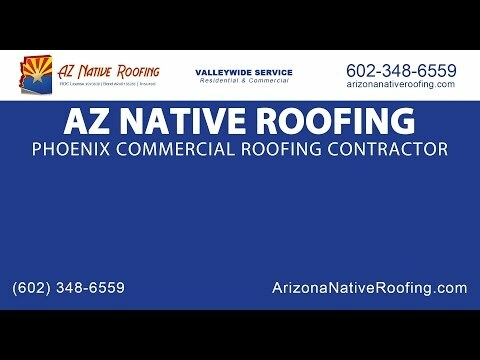 Be proactive and schedule a roof inspection with AZ Native Roofing Company so that we can send our expert roofers out to make sure that the Phoenix home you are investing a small fortune in will have a safe and structurally sound roof from the moment you sign the final documents and get those new keys. Do You Recognize the Early Warning Signs that Your Phoenix Roof is Failing?